Great Wet 'n' Wild Phoenix Details! Aerial Antics: Water Park Time! Time Machine: Not So Hair-Raising After All! Kings Island's Roller Coaster Momma! One Slice of The People's Playground, Please! Freestyle Music Park Giveaway Contest Winners! Introducing the New and Improved Cliff Hanger! The results from NewsPlusNotes' July poll are in, and it looks like the big park expansion you guys are most looking forward to is the Wizarding World of Harry Potter at Universal's Islands of Adventure theme park. The new land gathered 40% of the total votes to take the number one spot. Many details of the new expansion are still shrouded in secrecy, and the aspect of the unknown certainly makes the project high on my interest list as well. Six Flags Theme Park's is set to celebrate their 50th anniversary in 2011, and plans call for expansions at all the parks to celebrate. That news alone was enough for those plans to take the 2nd place spot with 26% of the vote. Coming in third, with 25%, was the mega expansion currently underway at Disney's California Adventure theme park. With some attractions open, several almost ready, and the amazing Carsland still to come I can see why this was a popular choice. The final three expansions didn't do so hot in our poll. 4th place (5%) went to the Ferrari World theme park in Dubai, and 5th place (3%) went to the brand new Universal Studios Singapore. Coming in last with less than 1% of the votes is the expansion slated for Hong Kong Disneyland. Now that has to tell you something about the reaction to their recently announced expansion plans! August's poll should be up soon! Can anyone else believe that it's already the last day of July? Where is the summer slipping away to? Enough of that, though, let's see what's happening in the industry. Yesterday the New York City Counsel approved a plan (and not by a little, it was 44 to 2) by Mayor Bloomberg to redevelop Coney Island. Amid towering condos and hotels, and lots of housing, shopping malls, and more, there will be a 12 acre amusement area crammed in along the boardwalk. 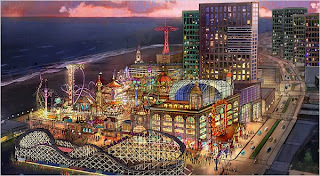 Is it me or isn't the reason anyone even cares about Coney Island because of it's rich history of being America's amusement park? Many people stand to make a ton of money off the redevelopment - but not off ride tickets, we're talking real estate here. How sad. Halloween Horror Nights fans already received some goodies to stare at with the release of drawings of a couple of the scareactors that will be at Hollywood's event this year. Let's just say that just looking at them sorta freaks me out - especially the one with a beak! Cedar Fair continues to take issue with the development of a new 49ers stadium in California's Great America's parking lot. In a recent article the park has said that if their concerns are not addressed they fear they will have to take "a more formal defense of our legal rights," and I can't imagine the stadium developers want litigation to hold up their plans. This one has been going on like a daily soap opera for some time now, and it end doesn't look too to be too near, either. Universal Orlando's parent company has filed for several trademarks which look to reveal the names of all the attractions in the currently under construction in the Wizarding World of Harry Potter at the Islands of Adventure theme park. The big mysterious dark ride will be called "Harry Potter and the Forbidden Journey." Dueling Dragons will now be "Dragon Challenge." To read more of the new names, check out this link. Perhaps there's more substance to the plans for a Paramount Pictures theme park at the former site of the Expoland Theme Park in Osaka, Japan. A new report details that the company behind the development plans to start to try to buy the land for the closed park soon, and that they hope to open the new park in 2012. Personally, I'm still not sure what to make of all this! 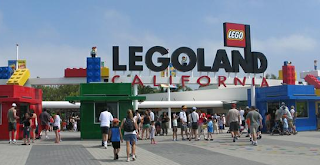 Good news from Legoland California, they're being reported as another one of the few American amusement and theme parks that are having a great year. Due in large part to their recent park expansions, and especially their recently opened Sea Life Aquarium, they've had their best Spring on record. In fact, the park's owner, Merlin Entertainment Group, is reporting a 28% growth in visitors at all 57 of its attractions this year. It's already time to think about 2010 season passes, Sesame Place is happy to announce that if you purchase a 2010 pass now you'll get in the park for the rest of 2009 on it! More details available at the park's website. Nik Wallenda's Cedar Fair cross country performance tour continues this Sunday with a walk taking place between the two towers for Dorney Park's Possessed roller coaster. If the weather cooperates NewsPlusNotes should have great content up from the event! In 1970 Cedar Point was celebrating their Centennial Year. A century before the peninsula was nothing more than windswept, forested land. But Sandusky businessman Louis Zistel saw the potential in the 364-acres. Zistel created his "getaway" on the white, sandy beaches of Lake Erie and used his own steamboat to ferry guests across the bay. The resort was named Cedar Point for the forest of cedar trees that carpeted the area. 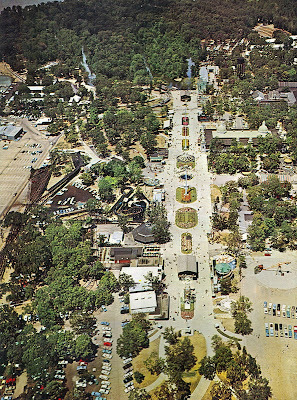 1970 kicked off the era of the Amazement Park, when Cedar Point continually amazed guests with new innovative attractions. And, there were many new attractions opening that year. 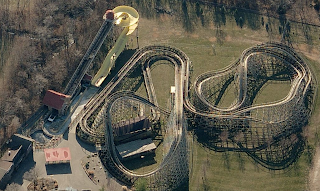 The Wildcat, built by Anton Schwarzkopf and designed by Werner Stengel, joined the coaster arsenal of the Blue Streak, Cedar Creek Mine Ride and the Jumbo Jet. 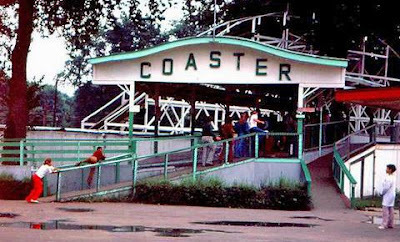 The Wildcat operated until 1978, it was relocated to Valleyfair! and replaced by the Wildcat that currently operates at the park. Other rides included Bayern Kurve, Dodgem #2, Monster, Schwabinchen, Calypso and Super Himilaya. 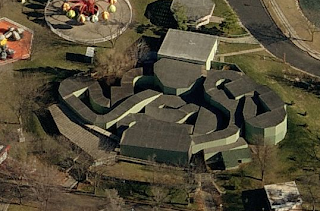 Kiddieland opened at its present site with 14 rides and a Lost Children's area. The Centennial Theatre, located near the Wildcat, opened. And Sealand, a large walk-through marine exhibit, opened over on the beach. Sealand had eye-level windows for guest viewing of sharks, penguins, and a variety of other aquatic animals. It was converted to an arcade after the 1998 season. If you want to check out some fantastic photos of Universal Studios Singapore's Jurassic Park river rafting ride under construction, this thread at Theme Park Review is the place to go! The photos show up close shots of the ride, which has it's channel already poured and theming and landscaping also well under way. Another exciting part of the ride looks to be a drop that sends rafts into a dark, enclosed portion of the ride. Looks amazing! The photographer also points out that the ride is to have a vertical lift, and that you can see track for a ride that looks similar to the Pteranodon Flyers at Islands of Adventure. I do like the Jurassic Park River Adventure at the other Universal parks, but always thought a river raft ride was just perfect for the theme. 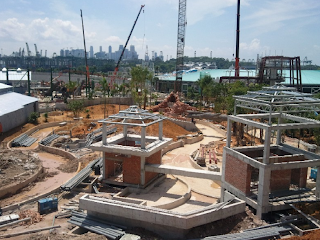 For even more recent photos of the park under construction, including the latest Battlestar Galactica coaster photos, check out the Sentosa Theme Park Blog. In conjunction with the upcoming release of the re-invention of the classic Fame movie, Six Flags Great Adventure will host the fourth stop on the FAME National Talent Search tour. To be held at the Jackson, NJ theme park on August 8th and 9th, the competition will be open to singers, dancers, musicians, and other performers who are looking for their big break. One winner from the park's eliminations will go to California for a final round of competition to possibly be the grand prize winner which gives them a meeting with a Hollywood talent agent, photo spread in OK! Magazine, a cash prize and much, much more. If you want to learn more you can check out Six Flag's page for details on the event! 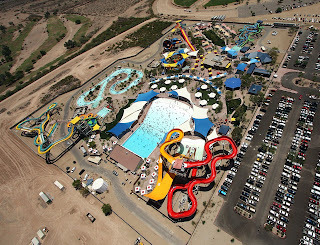 The $30 million park is set on 35 acres in North Phoenix and is the largest theme park in Arizona, featuring more than 30 exhilarating slides and attractions. 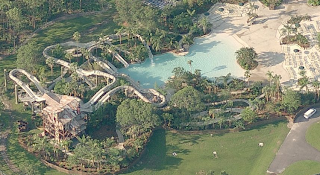 The above aerial view lets us check out all the slides, pools, and attractions they have to offer. Click to view a much larger image. On the left hand side of the park we see the yellow and green dueling water coasters, named Maximum Velocity. 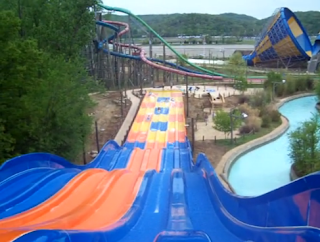 The park describes the slides as "dueling H2O Coasters that accelerate into a new area for water slides. The first and only ride of its kind in the world, this unique coaster allows guests to race in tandem tubes down two side-by-side slide tracks. 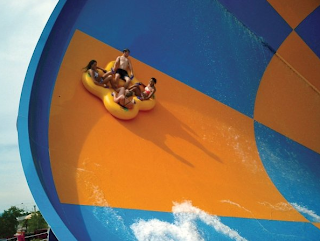 The gravity-defying water coasters blast riders uphill on jetted water and over 830 feet of hair raising drops and breathtaking curves." Also visible is the newly refurbished Monsoon Bay wave pool, which is also home to the Dive 'n' Movie series where park guests can watch films projected at the pool in the evening - and it's free with park admission! 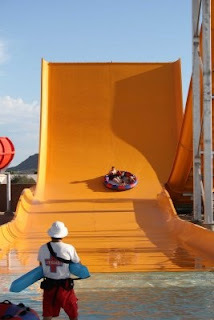 Wet 'n' Wild Phoenix also features the Tornado, a massive swirling blue and orange slide that four passengers at a time can partake in, as well as the brightly colored Desert Racers which allows families to experience the ultimate racing slide together. 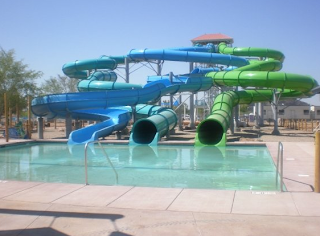 The three blue and green enclosed slides above are the Phoenix Flyers, which "gives guests the opportunity to create a true family fun experience with a choice of three slides with multiple twists, turns and drops down a four-story tower." Mammoth Falls! "A category five river rapid experience! All the fun of the white water rafting with an unexpected trip over Mammoth Falls." This slide "drops guests 57 feet before the raft goes vertical, shooting up a wall, then falling back to experience weightlessness before arriving safely to the calm waters below." But the park is not all extreme attractions. They have plenty for the little ones as well, including the park's lazy river, called Cactus Cooler - more than 1,200 ft. of relaxing waterways. The Serpentine Complex features two smaller slides as well as a bowl slide for the family, too. 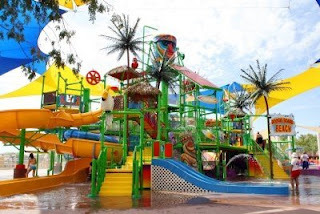 And seen above is the Soak'em Playground, a popular interactive water playground the kids are sure to love. 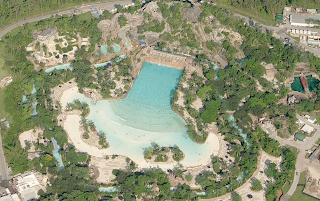 You can also take notice in the aerial above that the park has been filled with shade covers to help protect visitors from the sun - something I think every water park should have! The park is rounded out with a great selection of food and merchandise locations to please your every desire while visiting. To learn even more check out the park's official website and Facebook page! 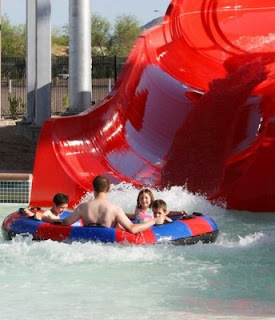 It really looks like a fun park - I only wish I could head to Phoenix to try it out. 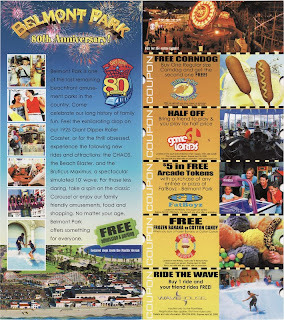 This week we check out an oft-forgotten seaside park that happens to be near and dear to my heart: Belmont Park in San Diego. I had to chuckle when I looked back through the NPN archives and remembered that it was only one short year ago that I sent Mike some photos of this park to share. We didn't even know each other back then! My how things change in a year, eh? While I do have last year's brochure, I decided to take us back a bit farther than that. Belmont Park, which opened on May 29, 1925, celebrated its 80th anniversary in 2005. Its famed Giant Dipper roller coaster, which opened on July 4th of the same year, shared this anniversary. 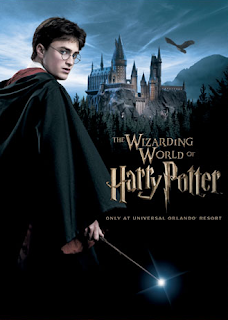 The 2005 brochure proudly marks this milestone, and the park even created a special logo to honor the occasion. Belmont Park celebrated its 80th anniversary in style by welcoming two new attractions. For the ride lovers, the park added a Chance-Morgan Revolution dubbed "Beach Blaster". And for the surfers, they added a monster wave machine which they aptly named "Bruticus Maximus". The latter, a FlowBarrel model from Wave Loch, was hailed by the surfing community as the world's first "dedicated surfing wave". 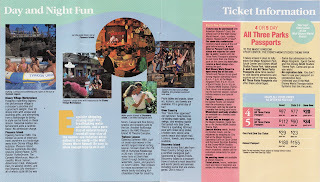 Although this brochure also throws the park's Chance Chaos into the "new" category, that ride actually opened in 2004. Bruticus Maximus needed a home, and Belmont delivered. The year 2005 marked the debut of the Wave House, a "beach lifestyle venue" featuring wave machines, restaurants, tiki bars, an athletic club, and two stages which frequently feature live music acts. 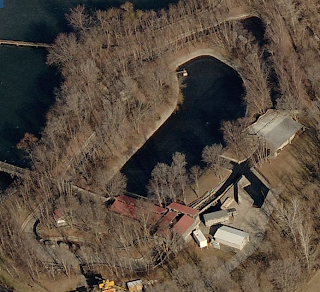 It is also the home of The Plunge, Belmont's historic swimming pool which opened with the park back in 1925. The Plunge is still the largest indoor swimming pool in the state of California! It's unfortunate that this brochure doesn't include more photos, but take my word for it: This is a fun little park! I always enjoy my visits, and hope to make it back soon! It's a well-known fact that most enthusiasts drool at the very prospect of riding their favorite coasters in the dead of night. Mt. Olympus Water & Theme Park has proven that the same rule applies to the general public. 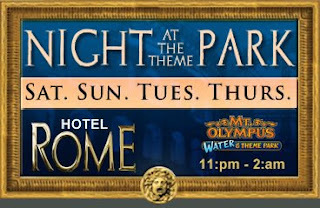 Earlier this month, owner Nick Laskaris pitched a novel idea to his staff which he dubbed "Night at the Theme Park". The original plan was to reopen select attractions two nights a week, from 11 p.m. to 2 a.m., for guests of the Hotel Rome only. But when 800 people--more than half the number the resort can accommodate--showed up on the first night, it became obvious that there was a much larger market for such an event. Mt. Olympus has since expanded Night at the Theme Park to four nights a week and opened it up to the general public. There's just one itsy bitsy little problem: A village ordinance prohibits amusements from being open past midnight Sunday through Friday, and past 1 a.m. on Saturday. Laskaris appeared before the village board a couple weeks ago to plead his case and suggest modifications to the ordinance, and most trustees as well as local law enforcement officers seem to be sympathetic to his cause. Although the board has yet to hold a meeting to discuss the ordinance and has not officially granted Mt. Olympus a temporary variance, the park continues to offer the event. And according to the local news, nobody seems to object. If the sheer popularity of Night at the Theme Park is any indication, I'd say Mt. Olympus is quite likely to get that variance. Wouldn't it be nice if other parks took a cue from this success story and instituted their own late night events! (Easier said than done, I know...) For more information on this unique event, including prices and a list of the rides that will be operating, refer to the Hotel Rome web site. Here's a report that we like to see - Six Flags St. Louis isn't talking numbers, but they are saying that their attendance this summer is actually up! The park added two new attractions this year to help draw crowds, the above Wahoo Racer slide and the Glow in the Park Parade. Both have become big hits with park guests, and the residual effect of the Evel Knievel wooden roller coaster added last year doesn't hurt either. More info an video here. The Images of America book series really is a wonderful effort in capturing American history in photos. Many titles take a close looks at great American amusement parks, and the title that features Hershey Park is no different. Written by Pamela Cassidy Whitenack, the book takes a look back at the long history of the now booming amusement park. From the early development of the park by Milton Hershey himself to the mega expansions of today, almost every detail is covered. 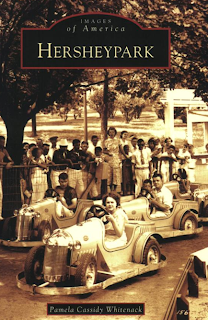 Be warned though if you go looking for photos and information of recent additions to the park, as this book (like all those in the series) focuses mainly on Hershey Park's early years. There are some neat photos of many of the modern sections of the park under construction in the 1970's, though. I never realized how little I actually knew of the history of Hersheypark! I suppose I thought that having done a report on Milton Hershey in 7th grade made me a subject matter expert, but boy was I wrong. The books is packed with little details that make me want to visit the park again and run around pointing out where long retired rides once stood! If you're interested in checking out the book for yourself, here's a link to it on Amazon. It's finally feeling like summer has hit and it's now hot outside. What's better on a stinkin' hot day during the summer than a water park? 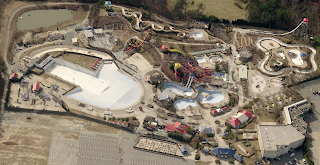 I thought it'd be fun to check out some of the coolest looking water parks for this week's Aerial Antics. Crush 'n' Gusher opened in 2005 and contains three different water coaster experiences. The complex is themed to a deserted fruit processing center, and has quickly become one of the most popular attractions at the park. 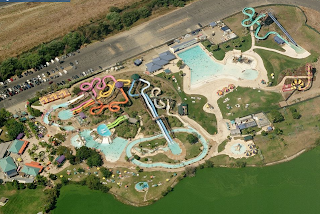 Here we see Raging Waters San Jose located in San Jose, California. 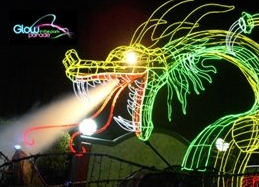 Located aside Lake Cunningham, the park features the Dragon's Den bowl slide as one of their premier attractions - and be warned, it features one angry looking dragon! 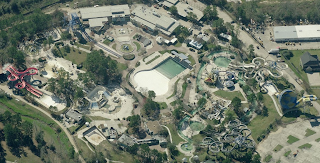 Seen here is Houston, Texas' SplashTown Water Park - now a member of the PARC Management family. May not be a name you hear of that often, but the park has a nice selection of water attractions such as the Tornado and RipQurl slides. Wet 'n Wild Emerald Pointe is another water park that features some unique attractions. While it may no longer be open, the Hydra Fighter II was a roller coaster that featured suspended cars and plenty of water action. (still standing in the above image) New this year is Dr. Von Dark's Tunnel of Terror, a new Proslide creation. 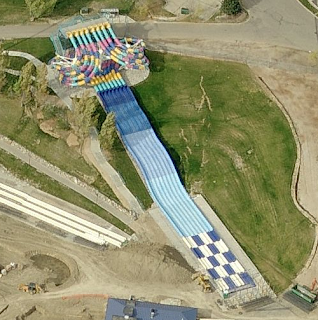 Water World in Colorado is an expansive park with a rather huge selection of slides. I should also point out that they have themed slides! Yes! Voyage to the Center of the Earth features dark ride sections with Dinosaurs and more, and Lost River of the Pharaohs takes riders on a journey back in time to ancient Egypt. And just because it looks pretty neat, here's one of the park's latest attractions, Turbo Racer. Nice colors! Formerly Laser at Dorney Park, Test Track has been testing it's new train in preparation for it's opening on the German fair circuit. Oddly, it almost appears as though the lift hill is now even slower than it was at Dorney! It's also worth noting that at least in the video the train is going noticeably slower than it used to, though I'm sure the train has broken in since then. I'm still liking the new colors, too! 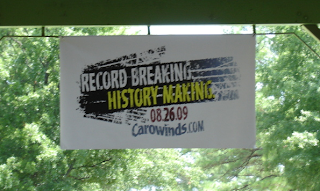 Carowinds held their first ever coaster enthusiast event yesterday, named Coaster Stock, and had a few teasers for fans of the park about their 2010 coaster plans. No details were announced, but we do have the above sign which features an announcement date of 8.26.09 and some very telling tire tracks. Rumors have swirled that Carowinds' new ride would possibly have a Nascar theme, some going as far as saying that it might involve Dale Earnhardt as well. Me? I have no clue! Following on the heels of the Big Bad Wolf announcement, I'm afraid I have yet another depressing piece of news to share. 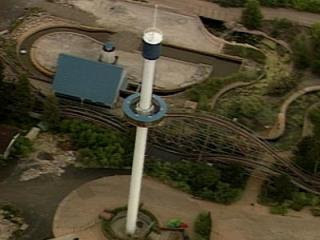 WKYC-TV has reported that the Skyscraper observation tower which once loomed large above Geauga Lake is no more. The ride has been dismantled bit by bit over the past two weeks, its future uncertain. Skyscraper, an Intamin Space Tower, was installed at Geauga Lake in 1974. After the park closed its gates for good in 2007, the tower was sold at auction for $12,500 to a bidder whose intention was to scrap it. However, it was later resold on eBay and ultimately ended up on Ital International LLC, where it is now listed as sold. We can only hope that its buyer intends to refurbish it and install it elsewhere rather than proceed with the scrapping plan. It's always sad to lose a piece of history! Sadly, in this case 'retirement' is polite for being removed from the park forever. Busch Gardens Williamsburg has made the sad announcement that the famous Big Bad Wolf roller coaster will be closed for ever after September 7th. 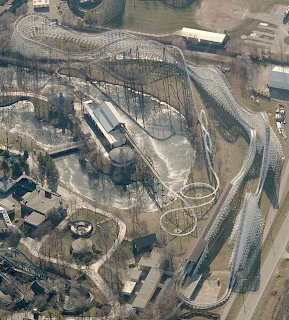 The ride opened in 1984 and is being called the world's first suspended coaster, which is only somewhat true because of the failure of The Bat at Kings Island, which sorta opened for a bit back in 1981. The Wolf was one of Arrow Dynamics' larger suspended coasters, and features an iconic 80' dive over the Rhine River as a finale to the ride. Sad news indeed. Props to the park for officially announcing the closure so that fans can get in one last ride! It's a shame when parks do not do this. The date was July 23, 2009. The location was Freestyle Music Park. The battle? Roller coaster versus toupee. Dennis Murphy was a man on a mission. It seems he was a bit disenchanted with the Freestyle Music Park commercial embedded above, which depicts a man exiting the Time Machine roller coaster with his toupee only partially intact. A proud toupee wearer and owner of a local hair replacement store, he responded by challenging the Time Machine to a duel. With John Stine (the park's director of sales and marketing) at his side, Murphy boarded the B&M behemoth to prove that there was no way a silly old roller coaster was going to separate him from his toupee. He was right! The toupee--with no help from Murphy's hands, which remained plastered to the grab bars--fared much better than its commercial counterpart and didn't budge. The contest was all in good fun, as even Murphy himself admitted to getting a laugh out of the commercial. He was simply trying to prove a point. Freestyle Music Park was happy to allow him to do so, and currently has no intention of pulling the ad. You can read the full story in The Sun News. So my question to Mr. Murphy is, when will he be heading over to Germany to challenge Ring Racer? Now that would be something! The Big Dipper (or Coaster as it was often referred as in later years) built 1924 by Fred Pearce, was the main attraction at the now defunct Chippewa Lake Park. The sleek out & back woodie is the last Pearce coaster standing (for now.) The park has been closed for over 20 years, and the Dipper was SBNO (Standing But Not Operating) for a few years before the park closed. Thirty plus years of neglict and weather has taken it's toll and it has been many years since this coaster was salvagable. Rotting wood and large trees have ensured that. The whereabouts of the train are uncertain, although internet rumors have it showing up as many places as Elvis. The brake levels and signage have also disappeared, and the station has started to collapse. So, why am I drudging up this sad tale now, well it seems the park and the Big Dipper's fate is finally sealed. The property has been sold and the remains of Chippewa Lake Park are being razed for future development. A lot of clearing has been done and it's only a matter of time before the Coaster is demolished. Part of me is very sad this day has come and part of me is releived that the park's fate has been decided. 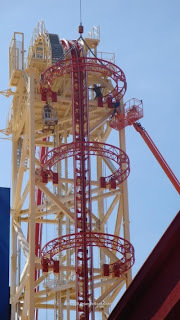 Hollywood Rip, Ride, Rockit's lift hill 'rings' have finally been added, much to the pleasure of all the enthusiasts wondering where they have been. Seen in the official concept art, they are one of the final pieces of the ride to be added. OrlandoRocks has a great new gallery up of the latest additions. Word on the street is that Universal employees will start to be able to take rides on the new roller coaster starting next week - which should hopefully mean that the ride will open soon! For those of you who haven't seen it yet, here's the official concept video preview of the ride! Looking to get your fitness on at Cedar Point in 2010? Well here's your perfect opportunity! Revolution3 Triathlon Series and Cedar Point have announced that they will hold both full and half Ironman length triathlons at Cedar Point and the surrounding towns next September. For those unfamiliar, a triathlon consists of swimming, running, and biking sections and would probably kill someone like me if I tried it! If you chose to partake in the full event, you'll be swimming 2.4 miles, biking for 112, and wrapping things up with two trips around a 13.1 mile course. Ack! Reports put total prize money at $150,000, and that's certainly not a small figure! The Point hopes to plan a series of events at the park prior to the race including possible night ride sessions for athletes and their guests. If all goes well the event will reach the finish line at the park which will making for some exciting times for park visitors as well. The event is set for September 12th, 2010 and more can be found on Revolution3's official website. When I decided to do a Disney brochure this week, I knew I was making a time commitment. This brochure is a detail lover's dream! And with so many individual parks to cover, I could probably spend the better part of the next week dissecting it. But I do enjoy sleeping once in a while, so I'll cover the basics and let you read the fine print for yourselves! When it comes to expanding their offerings, Disney is not capable of doing anything small. Whether it's a new restaurant, a new attraction, or an entirely new area, you can bet your bottom dollar that it's going to be big and impressive. 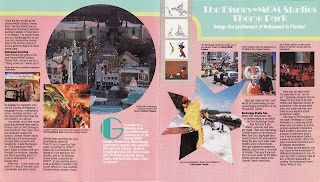 As the brochure cover indicates, the biggest thing to hit Walt Disney World in 1989 was the brand new Disney-MGM Studios Theme Park. But as we flip through the pages, you'll see that this was only the tip of the iceberg. 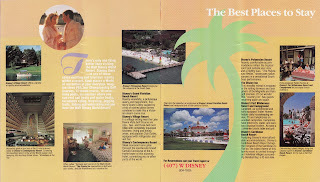 Keeping track of everything that was added to Walt Disney World in 1989 is no easy feat. 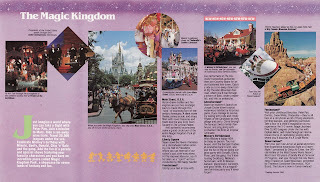 The designers of this brochure decided to make it even more difficult by placing "NEW" banners across the tops of many of the photos, some of which depict rides and attractions that were actually added in previous years. This particular photo is true to its banner, as it highlights one of the many shows set to premier at the Disney-MGM park. But beware of imposters! There's no questioning the "newness" of this particular attraction. Disney-MGM Studios Theme Park (now known as Disney's Hollywood Studios) most certainly did make its debut in 1989, and as with all things Disney, it took "state-of-the-art" to a whole new level. Hollywood Boulevard, complete with a replica of the famous Chinese Theatre, was recreated. The Great Movie Ride brought classics to life right before guests' very eyes. You could add your own sound effects to a movie, have your senses assaulted by explosions and floods, and even witness new movies and TV shows being filmed. The Magic Kingdom needs no introduction. A staple of Walt Disney World since it opened, this is a park where imagination comes to life. If yours is a little rusty, perhaps you can rejuvenate it by reading the description of Mickey's Birthdayland, which encourages you to wish the jolly ol' mouse a happy 60th birthday. Only trouble is, the year was 1989 and Mickey turned 60 in 1988! (That's also when his Birthdayland opened, by the way.) Perhaps he was stuck in a time warp? 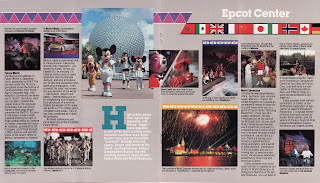 Magic Kingdom actually did welcome a new attraction in 1989, although you'd have to read through this entire section to learn about it. Dreamflight, presented by Delta Air Lines, replaced the former If You Could Fly attraction in Tomorrowland. Utilizing an Omnimover ride system, Dreamflight took its passengers on a journey through the history of aviation. Hmm... I'm starting to think that this entire brochure is stuck in a time warp! Not a single thing labeled as "new" on these pages actually opened in 1989. Maelstrom, along with the rest of Norway, joined EPCOT Center in 1988. The spectacular IllumiNations show also premiered in '88. And Captain EO? Why, he had been around since 1986! I guess "new" is a relative term within the context of this brochure. Although it is not mentioned, there was one new addition to EPCOT in 1989: The Wonders of Life pavilion, which opened late in the year. Perhaps it was not far enough along to merit a write-up in the '89 brochure. On a side note, nothing spells '80s culture like a dude in a pastel-colored suit! [upper left-hand corner] Thank goodness that we as a society have come to our fashion senses since then! Of all the pages in this brochure, these are the ones which deserved to have that "NEW" banner slapped all over them. And yet...nada. Since Disney apparently has fallen down on the job in this one instance, allow moi to enlighten you! Whew... I'm beat! If nothing else, sharing this brochure has made me painfully aware of how much Disney history I have yet to learn. How is it that I always walk away from these posts with something new on my to-do list? 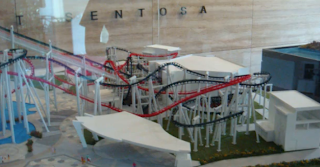 The Sentosa Theme Park blog has posted a new video of photos taken at the construction site of Universal Studios Singapore. The photos focus mainly on the Battlestar Galactica roller coaster construction. 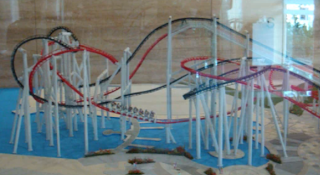 At the end of the video there are close up shots of the model of the ride that is on display at the site, which allows viewers to get a great idea of the dueling coasters' layout. Keep in mind when following the track that the blue side is a more intense inverted coaster, while the red track is more family oriented and features sitting trains. Looks like fun, no? Upon reading the title of this post, I'm sure that more than a few of you did a double take. Busch Gardens where? Yes, the Busch Gardens family used to have a sister park in California! 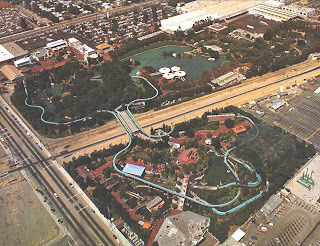 It was located in Van Nuys, to be exact, although the branding seen on old park literature seems to indicate that it probably went by the moniker "Busch Gardens Los Angeles". Popular Los Angeles blog site LAist recently published an article covering this park's all too brief history. While the California incarnation of Busch Gardens was famous for its brewery tours, gardens, and exotic birds as opposed to high-tech thrill machines, it did feature a handful of traditional rides, including a log flume. Unfortunately the article is light on photos, but it's still a good read for those interested in learning more about this long lost park. 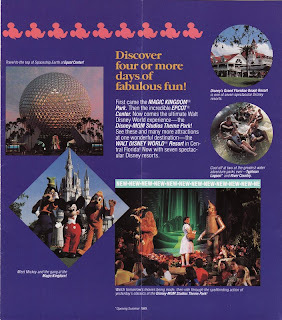 If you make it through the history lesson and you're still thirsting for more, check out this blog post from Vintage Disneyland Tickets, which contains the full-size brochure images that were used in the article. I just love a blogger who appreciates not only brochures, but the frustration that ensues when they are not dated! 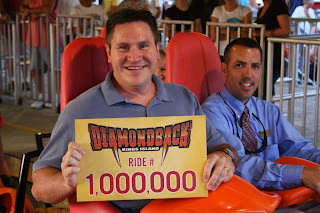 MASON, Ohio – Jim McDonel from Buffalo, New York was the 1,000,000th rider on the new Diamondback roller coaster at Kings Island Amusement Park since the $22 million ride opened April 18, 2009. The 43-year-old McDonel was accompanied on the ride Monday by Kings Island’s manager of park operations, Tony Carovillano. Adventureland amusement park, located just outside of Des Moines, Iowa, opened in the mid 1970s and has thrived ever since. Not one of the huge corporate parks we are all so familiar with, Adventureland has been family owned for it's entire existence. We have the train crossing with station, tunnels under the tracks to enter the park, a large plaza thereafter, and finally a detailed Main Street entrance area to the park! The park does have some unique rides in it's arsenal of thrills. Above we see The Underground, a dark ride/wooden roller coaster hybrid added to the park in 1996. It was designed and built by Custom Coasters, and if I remember correctly utilized an old amphitheater as the base for the ride. The park is also home to the Raging River, an Intamin river rapids ride that was added to the park in 1983. 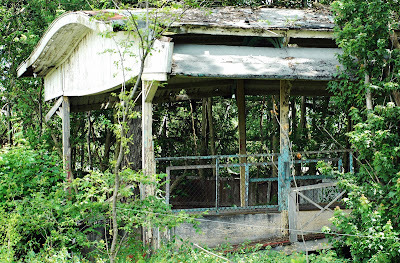 This makes it one of the older ones still operating, as the first one ever opened in 1980 at AstroWorld in Texas. Two coasters in one shot! The wooden ride is called the Tornado, designed by William Cobb and opened back in 1978. The interesting steel coaster is Dragon and was designed by Hopkins and added in 1991. 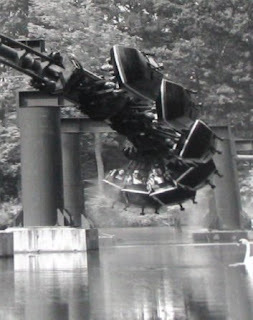 The Underground was actually Adventureland's second time working with Custom Coasters, the first partnership in 1993 resulted in the ride above, named Outlaw. Hard to tell from the photo but the ride sits on a hillside which allows it to have some neat elevation changes. May not be the biggest or fastest ride, but I've heard it packs a punch. Also in the photo is one of the park's newer rides, Saw Mill Splash, a White Water West spinning rapids ride added in 2002. 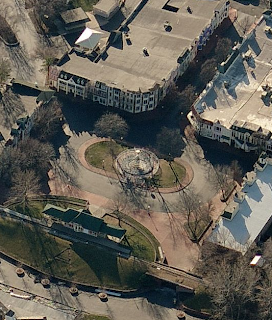 To check out the aerials from Bing click here.